Once Again, Immigration Is A Hot Campaign Issue Republicans plan to use Democrats' opposition to Arizona's controversial law as a key talking point in this fall's campaigns. As the November midterm elections approach, the immigration issue has gone from simmer to full boil. Gov. Jan Brewer, a Republican, is waiting to hear whether an appeals court will reinstate the most controversial elements of a state law designed to crack down on illegal immigration. 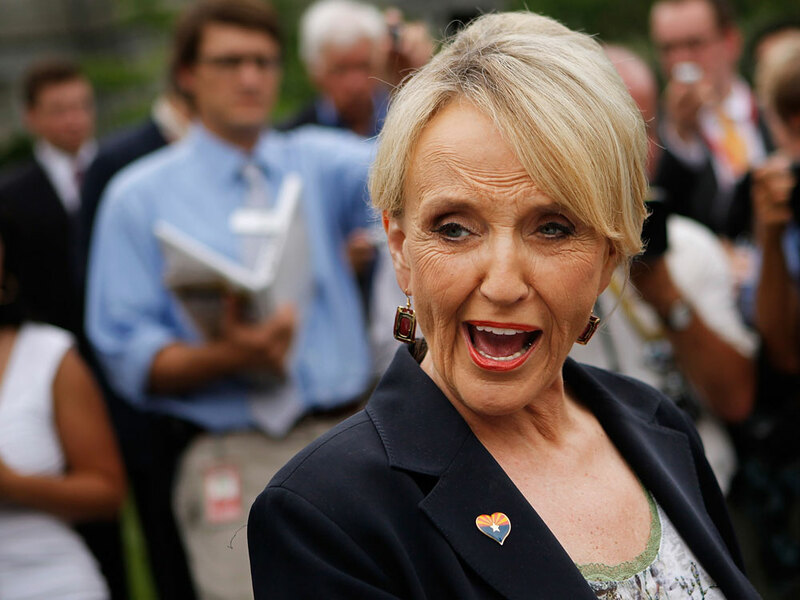 Brewer's support for Arizona Senate Bill 1070 may be helping in her re-election bid. And now more Republicans are picking up the immigration mantle, hoping it will help them in November. Arizona Gov. Jan Brewer, who appears to have gotten a political boost from her support of the immigration law. Immigration has been one of the hottest topics on conservative talk radio programs. Just hours after U.S. District Judge Susan Bolton ruled Wednesday that key provisions of Senate Bill 1070 would have to be put on hold, a caller to host Peter Boyles' program on Denver station KHOW said the judge should be "hung, impeached or fired." Security at the courthouse in Phoenix where Bolton works has been strengthened because of the threats she has received. The local U.S. Marshals office says a lot of the threats were just people venting, but some are being investigated. The news out of Arizona is hitting home as far away as the small town of Summerville, S.C. There, City Councilman Walter Bailey wants to force employers to check immigration status of workers and landlords to check renters. In Colorado, Republican Senate candidate Ken Buck told a Tea Party gathering that if he’s elected and a similar situation arises he will react even more strongly than his GOP colleagues did. "I will stand up. I will turn my back and I will leave whatever chamber I am in," said Buck as the Elizabeth, Colo., audience erupted into applause. You can bet images of Democrats standing and applauding Calderon will show up in campaign ads soon, says former Colorado Rep. Bob Beauprez, a Republican. He says immigration already has been a key issue in the GOP primary in Colorado. "The contestants are trying to appear, at least, tougher on the issue than their opponent," says Beauprez. "Everybody's trying to one up the other one." Immigration is one of those hot-button issues that can mobilize voters -- as it did in the early stages of the 2008 Republican presidential primaries -- and that can be especially important in a midterm election when turnout is lower. — "For any lawful contact made by a law enforcement official or agency of this state or a county, city, town or other political subdivision of this state where reasonable suspicion exists that the person is an alien who is unlawfully present in the United States, a reasonable attempt shall be made, when practicable, to determine the immigration status of the person." But it's not just supporters of the Arizona law who are angry. Those who oppose it have vented their anger during street protests. It's not clear, though, that outrage over the law will prompt Latino voters to turn out in greater numbers than they did in the 2006 midterm election. Stanford political science professor Gary Segura does consulting and polling for Latino and Democratic-leaning organizations. He says many Latinos are discouraged because Obama hasn't yet made good on his campaign pledge to overhaul immigration laws. "I would predict that Latino voter turnout in 2010 would be lower than Latino voter turnout in 2006," says Segura, "which would be damaging for the Democrats." In the long term, Segura says, the immigration issue may hurt Republicans, as minorities make up an increasing share of the electorate. He points to the California experience in the wake of Proposition 187, which barred illegal immigrants from access to state services. It helped Republican Gov. Pete Wilson win re-election in 1994. But a backlash helped establish a Democratic majority in California that has proved difficult for Republicans to overcome. Now some are wondering if that same situation may be playing out in Arizona.